Black Lives Vs All Lives. “All Lives Matter”, but Mine Didn’t Matter Enough. Is The Fresh Prince still Fresh? More Than Just a Hashtag. Drowning out the noise & Finding the true meaning. Hello and Welcome Curious Minds! Today I thought I would talk about the divide between the Black Lives Matter movement and All Lives Matter. Since starting this website I have received a lot of hate and racism. It has been very difficult to digest but I feel as though this is all part of the process. It is part of the process because at the heart of the movements lies racism, racial discrimination etc. I know this because, if racism was not involved then we would not have the Black Lives Matter Movement. Without the BLM movement, we wouldn’t have people demanding All Lives Matter. I have already created a blog post that details all of the information surrounding the BLM movement (which I will link here.) As a result of this, I am going to do a brief summary explaining what the BLM movement is. The Black Lives Matter movement has been around for just over three years. It was created by three women (named bellow), after the death of Trayvon Martin. The movement was created as a call to action. They founded the movement to help protect black lives. It was created after the numerous police shootings similar to that of Michael Brown in Ferguson. As a movement that is tired of seeing the repetition of events, that contribute to the demise of black communities. BLM are looking to stand up for the rights of blacks. The movement acts by standing up against the injustice from police brutality to cultural appropriation, and everything in between. The movement is seeking that society acknowledges the worth and humanity of the black society. Although the All Lives Matter is not exactly a movement, after the creation of the BLM movement by; Alicia Garza, Opal Tometi and Patrisse Cullors. The Black Lives Matter movement began gaining widespread attention. 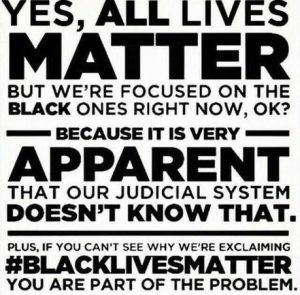 In turn people started using the #alllivesmatter as a response to the movement. society does not consider black lives to fall beneath the umbrella of the “all lives” statement. “All Lives Matter” is a phrase that people use in order to express that not just black lives are important. The miss communication between the Black Lives Matter movement and All Lives Matter is that society already values white lives. Individuals who comment ‘all lives matter’ fail to realise or even acknowledge, that society does not consider black lives to fall beneath the “all lives” statement. If all lives truly mattered there would not be racism or discrimination on such a large scale. Some commentators state; that they say “all lives matter” simply because they wish to stress that not just black lives are important. Despite the stress and emphasis, black lives matter supporters put when explaining that the movement is not about believing no other races matter. Social media plays a large role in the BLM movement. In the 1960’s it took a lot of effort to broadcast or make know any urgent news to the rest of the world. In 2017 however, as a civil rights activist, there are several platforms at your leisure. With the numerous social media platforms from Vine, Instagram or Periscope for video posts. GroupMe which allows for direct conversations that are private and between whoever has access to that group. Least we forget twitter, although limiting in its amount of characters, twitter’s 140 characters enables users to create more of an impact, all the while allowing you to create a hashtag and become a trending topic. There has been a pre-existing system over the past 400 years. This system has led to the point where supporters say “Black Lives Matter”. Supports chant this in order to set in motion a dismantling of that same system. Enabling the race to been truly seen as equal. This, however, is not achieved without the demise of the original system. It can be very difficult to understand why people say “All Lives Matter” as an argument against the Black Lives Matter movement. However, a vast majority of those that support and argue “All Lives Matter” have not been subject to the past treatment that blacks have. As a consequence they spout such comments like “all lives matter, not just blacks” or some say “black lives don’t matter, all lives matter.” Which in itself diminishes the meaning behind the all lives matter statement.